Cinnamon Roll Pancakes are an over-the-top treat to serve for a birthday or special occasion. 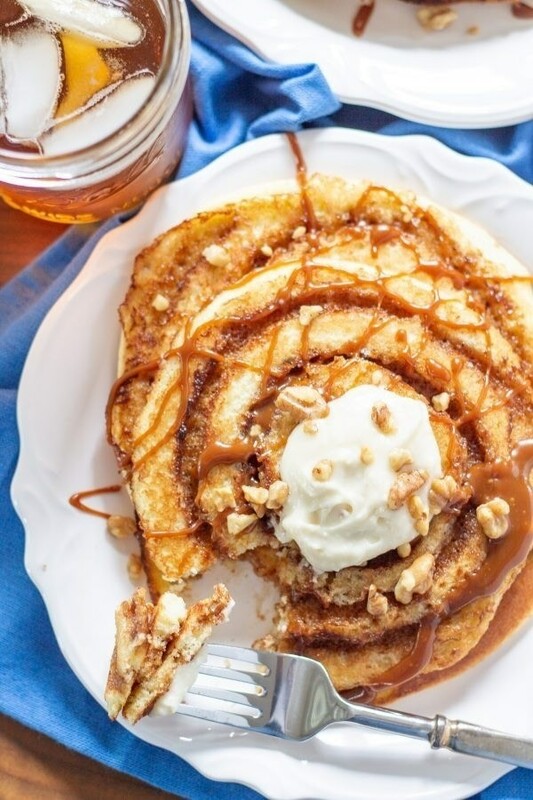 These decadent Cinnamon Roll Pancakes are made with vanilla cake batter swirled with cinnamon sugar, and topped with toffee sauce and cream cheese frosting. First, prepare the cake batter. The trick for using cake batter to make pancakes is to add less liquid than it calls for on the box. I used a box that called for 1 cup of water and 1/2 cup of vegetable oil. I added only 1/2 cup of water and it was the perfect thickness. If you are using a mix that calls for slightly different ingredients, just add 1/2 cup less liquid. Set the batter aside while you prep the other ingredients. To make the cinnamon sugar for the cinnamon swirl, just whisk all the ingredients together. Pour into a pastry bag or plastic bag and slice a small hole in the tip. For the toffee sauce, melt the butter in a saucepan over medium heat. Add the sugar, and stir frequently until the mixture becomes golden brown. Then whisk in the cream and vanilla. 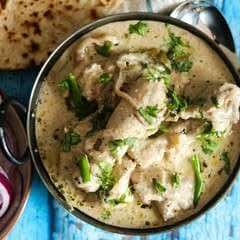 Let simmer and thicken until the sauce is thick enough to stick on the back of a spoon. Keep warm over very low heat. To prepare the cream cheese frosting, beat the cream cheese in the bowl of an electric mixer. Once whipped, melt the butter, and slowly add it in while the mixer is running. Once the butter and cream cheese are well mixed, add the powdered sugar and vanilla and mix until smooth. Now it is time to make the pancakes. I recommend making them one by one. Add just a small slice of butter to a non-stick skillet and heat over medium heat. Once the butter melts add a little less than 1/3 cup of the batter to the skillet. 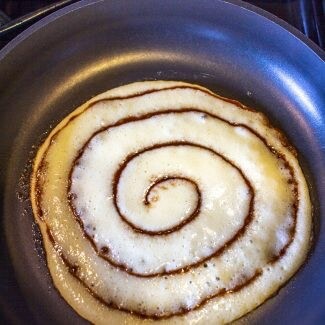 Let the pancake cook for 1-2 minutes and then add a swirl of the cinnamon sugar. Let the pancake continue cooking until some bubbles form on top and the pancake is golden brown. Use a spatula to flip the pancake and let it cook for another 1-2 minutes. Follow this process making pancakes one by one, adding more butter to the skillet as necessary. You will end up with about 10-12 large pancakes. 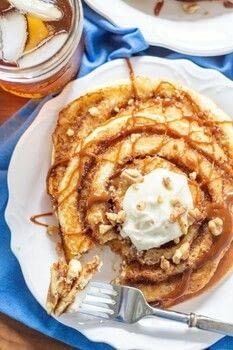 Top the pancakes with a drizzle of the toffee sauce, a dollop of the cream cheese frosting, and some toasted walnuts. Enjoy the sugar high.